Most of us don't think too much about the exhaust gas recirculation systems in our cars, at least not until the EGR light on the dash comes on. The system isn't particularly exciting, since it's mostly for pollution control and doesn't do much for making your car go faster or louder or driftier, or any number of other engaging things. That's why I really like this picture of the EGR system's more exciting, experimental days. Most people have never seen an EGR valve, and they're not really much to look at in their highly integrated and engineered form. But early on, back in 1960, when UCLA researchers Richard D. Hopa and Hiroshi Kimura were developing the device, it was a large, external mass of chrome pipes and coiled lines and heat shields. 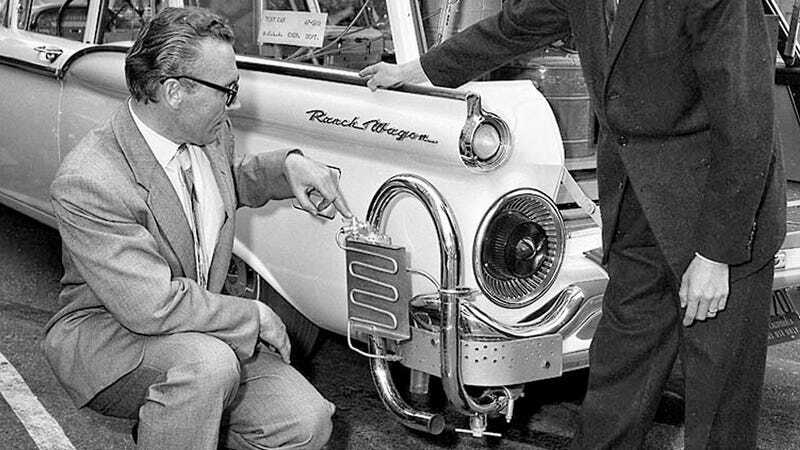 The prototype, mounted here on a fetching Ford Ranch Wagon, looks a bit like a partially-untangled French horn or some kind of steampunk mechanical-man intestines. The goal of an EGR system is to actually lower the overall combustion temperatures of the cylinders, so more nitrogen oxides (NOx) can be burned, leading to more efficiency and less pollution. It's an unsung hero of modern engines that can put out better air than they take in. Maybe it's time for some cars to have big, chrome, external EGRs again.